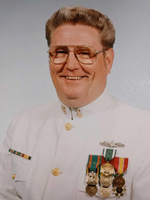 BTCM (SW) (U.S. Navy Retired) Henry ”Hank” J Mahaney, 75, passed away peacefully at home with his family on April 2, 2019. Hank was born on March 27,1944 in Queens NY, and then moved to Lindenhurst, NY where he grew to love working on the water. His love of the water and passion to serve his country led him to join the Navy in April 1964. He continued to serve with honor receiving many commendations until he retired in May of 1994. After he retired he continued to serve his country by being an active member of his community of Newport News donating his time to many charitable organizations. He was preceded in death by his wife, Carolyn Sue; daughter, Christina Michele; his parents, Catherine and Francis Mahaney; brothers, Francis, James, and Richard. Left to cherish his memory are his sister-in-laws, brother-in-laws, nieces, nephews, great nieces, great nephews, and a multitude of close friends. The family will receive friends from 6:00 – 7:30 p.m. on Thursday, April 25, 2019 at Weymouth Funeral Home. A Funeral Mass will be held at 12:30 p.m. on Friday, April 26, 2019 at St. Jerome Catholic Church. A private burial will take place at Arlington National Cemetery. The family would like to thank Riverside Hospice and Visiting Angels for their loving care. In lieu of flowers, the family asks donations be made to the Wounded Warrior Project at www.woundedwarriorproject.org or The Doorways at www.thedoorways.org. Arrangements by Weymouth Funeral Home.